The number of clusters to form as well as the number of centroids to generate. 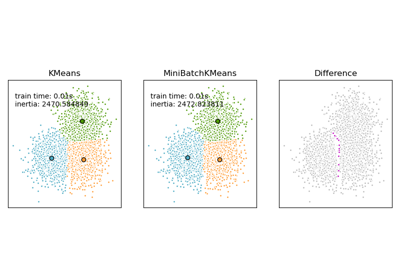 ‘k-means++’ : selects initial cluster centers for k-mean clustering in a smart way to speed up convergence. See section Notes in k_init for more details. 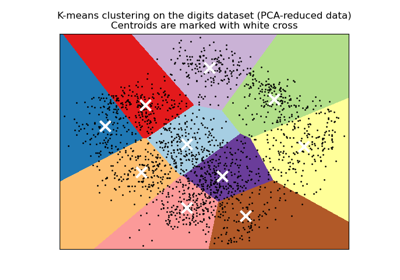 ‘random’: choose k observations (rows) at random from data for the initial centroids. If an ndarray is passed, it should be of shape (n_clusters, n_features) and gives the initial centers. Number of time the k-means algorithm will be run with different centroid seeds. The final results will be the best output of n_init consecutive runs in terms of inertia. 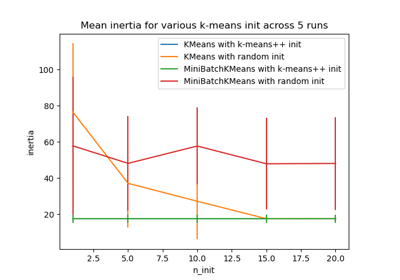 Maximum number of iterations of the k-means algorithm for a single run. 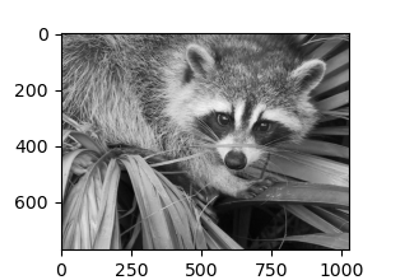 Precompute distances (faster but takes more memory). 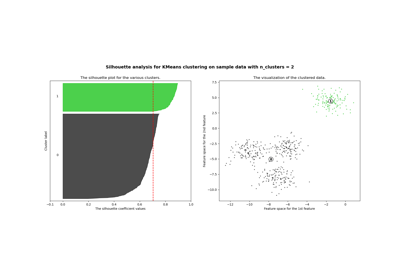 ‘auto’ : do not precompute distances if n_samples * n_clusters > 12 million. This corresponds to about 100MB overhead per job using double precision. Determines random number generation for centroid initialization. Use an int to make the randomness deterministic. See Glossary. When pre-computing distances it is more numerically accurate to center the data first. If copy_x is True (default), then the original data is not modified, ensuring X is C-contiguous. If False, the original data is modified, and put back before the function returns, but small numerical differences may be introduced by subtracting and then adding the data mean, in this case it will also not ensure that data is C-contiguous which may cause a significant slowdown. The number of jobs to use for the computation. This works by computing each of the n_init runs in parallel. None means 1 unless in a joblib.parallel_backend context. -1 means using all processors. See Glossary for more details. K-means algorithm to use. 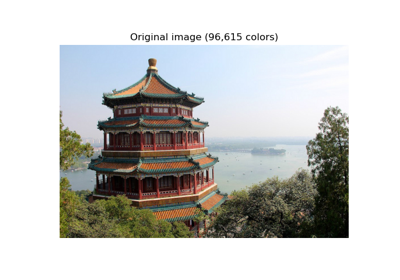 The classical EM-style algorithm is “full”. The “elkan” variation is more efficient by using the triangle inequality, but currently doesn’t support sparse data. “auto” chooses “elkan” for dense data and “full” for sparse data. Coordinates of cluster centers. If the algorithm stops before fully converging (see tol and max_iter), these will not be consistent with labels_. Sum of squared distances of samples to their closest cluster center. Alternative online implementation that does incremental updates of the centers positions using mini-batches. For large scale learning (say n_samples > 10k) MiniBatchKMeans is probably much faster than the default batch implementation. The k-means problem is solved using either Lloyd’s or Elkan’s algorithm. The average complexity is given by O(k n T), were n is the number of samples and T is the number of iteration. In practice, the k-means algorithm is very fast (one of the fastest clustering algorithms available), but it falls in local minima. That’s why it can be useful to restart it several times. If the algorithm stops before fully converging (because of tol or max_iter), labels_ and cluster_centers_ will not be consistent, i.e. the cluster_centers_ will not be the means of the points in each cluster. Also, the estimator will reassign labels_ after the last iteration to make labels_ consistent with predict on the training set. 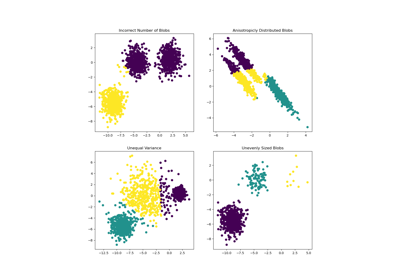 fit(self, X[, y, sample_weight]) Compute k-means clustering. fit_predict(self, X[, y, sample_weight]) Compute cluster centers and predict cluster index for each sample. fit_transform(self, X[, y, sample_weight]) Compute clustering and transform X to cluster-distance space. 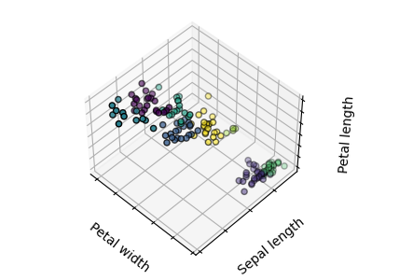 predict(self, X[, sample_weight]) Predict the closest cluster each sample in X belongs to. score(self, X[, y, sample_weight]) Opposite of the value of X on the K-means objective. transform(self, X) Transform X to a cluster-distance space. Training instances to cluster. It must be noted that the data will be converted to C ordering, which will cause a memory copy if the given data is not C-contiguous. not used, present here for API consistency by convention. 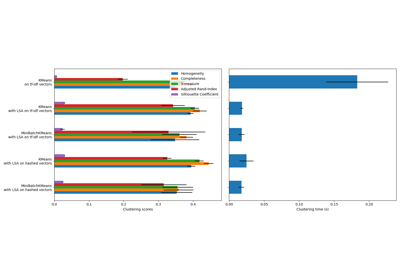 Compute cluster centers and predict cluster index for each sample. Convenience method; equivalent to calling fit(X) followed by predict(X). Index of the cluster each sample belongs to. Compute clustering and transform X to cluster-distance space. Equivalent to fit(X).transform(X), but more efficiently implemented. X transformed in the new space. Predict the closest cluster each sample in X belongs to. In the vector quantization literature, cluster_centers_ is called the code book and each value returned by predict is the index of the closest code in the code book. Opposite of the value of X on the K-means objective. Transform X to a cluster-distance space. In the new space, each dimension is the distance to the cluster centers. Note that even if X is sparse, the array returned by transform will typically be dense.